Jim P. here in for Laura who’s out partying meeting with other librarians. Those librarians sure do party meet a lot! This weekend we were treated to a lovely contest puzzle by fellow Fiend Matt. We’re told we’re looking for the name of a cocktail. We get a hint at 62d [What a cocktail served “on the rocks,” like the contest answer, contains] with the answer being ICE. This is both a hint and a red herring as we’ll see. First off, the solve was smooth and fun. The theme answers are all solid and interesting and cluing felt lively and fresh. Any hidden words spanning the theme phrases? None detected. Do the initialisms of the phrases have any significance? None detected. Are there any other instances of ICE in the grid? Nope. Anything in the clues worth noting? Again. Nope. Hmm. Getting nowhere. The revealer clue seems to indicate that the cocktail in question contains ICE. Maybe if I look through a list of cocktails, I can find one with ICE in the name and then try to work the meta backwards. Here’s a great list of ranked cocktails. But alas, I didn’t see any with the letter string ICE in the name. I did note that the #1 rated cocktail around the world is the Old Fashioned. Huh. Might have to try that one of these days. But what kinds rocks are there since there’s only the one ICE in the grid? I looked below each themer for the rocks thinking the letters I needed would be in the themer. This went nowhere. Then I looked in the theme answers themselves for the rocks. I honestly don’t remember the aha moment, maybe it was the second answer since it starts with OREO, but ORE is the “rock” I was looking for. Whew! Above the four OREs we have, well looky here!, OLD FAS HIO NED. And that’s your contest answer for the week. I quite enjoyed that hunt for the meta answer. It’s so serendipitous that the #1 cocktail in the world happens to be 12 letters long and each of the four trigrams can stack with the letters ORE in a workable manner. Very impressive conception and execution! As for the grid, there are some awkward partials (TOLD A, IN HOT), but notably, those are in two of those constrained sections. I have never seen BAI [“See ya,” cutesy-texting-style], but I don’t tend to be up on the latest trends. I did like HAROLD, AFRICA, WELCOMES, AMADEUS, NOT YET, and MOORISH. 20a [Maude or Kumar’s movie partner]. HAROLD. Ha! The films are Harold and Maude and Harold and Kumar [do whatever]. Not the same character in the films…at least I don’t think so. 43a [It’s tied when an NHL game starts]. SCORE wouldn’t fit, but LACE did. 49a [Papa’s mama]. NANA. I like this because of its simplicity and the parallel structure of the words. 17d [Brown using a pan]. ALTON. Oooh. Sneaky. Good one. 18d [Genesis name]. PHIL. Another good bit of misdirection. That’s PHIL Collins of the band Genesis. 24d [2016 Spielberg movie, with “The”]. BFG. It stands for “big, friendly giant” in the film and Roald Dahl book. But it has a different meaning in video gaming. 25d [1982 song that mentions Kilimanjaro]. AFRICA. I had to smile at this one. My 10-year-old daughter knows and sings this song for some reason. Has it been experiencing some sort of resurgence that I don’t know about? 42d [Last movie with two Best Actor nominees]. AMADEUS. Did not know this factoid, but I love the film. I’m guessing Tom Hulce and F. Murray Abraham were the nominees. Yup, they were. And it was Abraham who took home the prize. Wonderful puzzle and meta. 4.25 stars. Can’t tell if you’re kidding about resurgence of Africa’s “Toto” or not, but just in case..
Gotta share this one, too. I sent in SingapORE sling, thinking that is a pretty lame meta. The actual answer is pretty darn good. I found the fill a pain in the neck but did get the answer. I did the same, looking for ice. 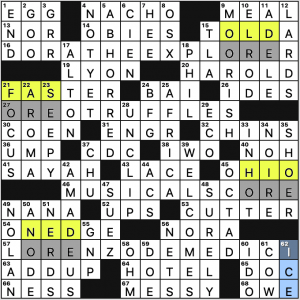 My first reveal was “crossword rocks” and luckily, I actually thought of ore since it is the most common “rock” used in crosswords. Then I loved the double entendre of “on the rocks” since the answers were literally on the rocks. Great puzzle. Good one Matt. I liked it! Reminded me of “Marie Kelly’s” August 26, 2016 WSJ puzzle, “My Treat,” where Mike was looking for his favorite dessert. That was in my early meta days, and so like an idiot noob, I submitted “Marie Biscuit.” Minutes later, I noticed that ICE CREAM SUNDAE was spelled out atop every occurrence of the word ME (“It’s on me”). Matt, thank you. This was a good one. To my shock, I solved the meta in about two minutes. I’m always thrilled when I get any meta. Great meta! Fantastic review of the puzzle, too. I learned what BFG means in video gaming. Plus I go home with a link to the 50 most popular cocktails. My favorite, the negroni, comes in at number 2. My rabbit hole was that there were two “ice cubes” in the puzzle. IE, two 4-letter squares that contained the letters I, C, and E, in addition to another letter. 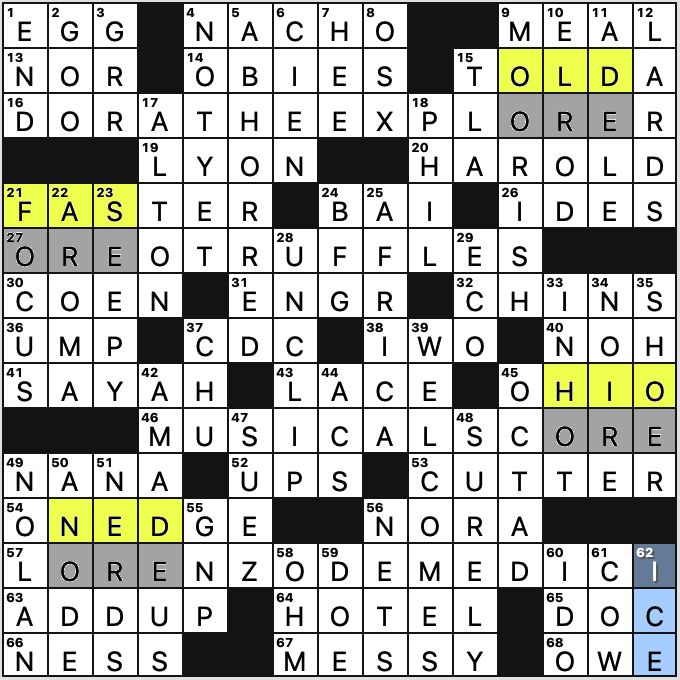 Those two letters were H and W, and I wasted way too much time trying to figure out how to make “Harvey Wallbanger” work as the contest answer.